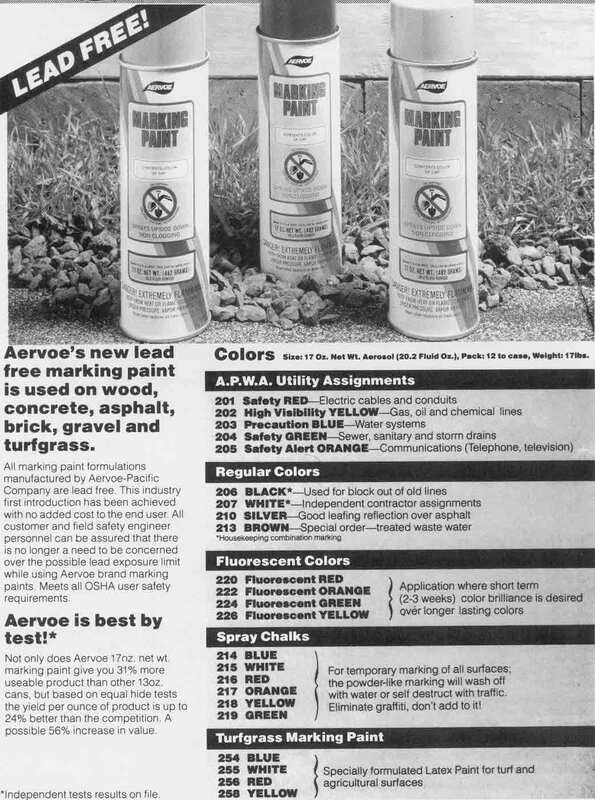 Description: Aervoe's new lead free marking paint is used on wood, concrete, asphalt, brick, gravel and turfgrass. All amrking paint for mulations manufactured by Aervoe-Pacific Company are lead free, This industry first introduction has been achieved with no added cost to the end user. All custormer and field safety engineer personnel can be assured that there is no longer a need to be concerned over the possible lead exposure limit while using Aervoe brand marking paints. Meets all OSHA user safety requirements. Not only does Aervoe 17oz net wt. marking paint five you 31% more useable product than other 13oz. cans, but based on equal hide test the yield per ounce of product is up to 24% better than the competition. A possible 56% increase in value. Net Wt. Aerosol: 20.2 Fluid Oz. *Application where short tem (2-3 weeks) color brilliance is desired over longer lasting colors. *For temporary marking of all surgaces; the powder-like marking will wash off with water or self destruct with traffic. Eliminate graffiti, don't add to it!